The problem with a website using the blog format is that everything is treated as news and as more posts are added the old ones move down the page and then end up in the Archive. This can make it very difficult to find anything. So I am hoping that this page will provide information and pictures of the HD locos which is easy to access and overcomes both the archive problem and possibly the need for a separate gallery. You can click on a picture to get a full size version and then scroll through all the pictures on the page. The first was the ubiquitous 0-6-2T tank engine based on a LNER N2 prototype in BR Livery with the number 69567 and no coal in the bunker. This loco was the first one introduced by Meccano in the new Hornby Dublo range back in 1938 when it was available in LNER, LMS, GWR and Southern liveries. It is very poorly detailed and only received coal in the bunker towards the end of the of the Meccano company which was taken over by Triang in 1964. My third loco was Silver King a model of the Gresley A4 pacific 4-6-2 in BR Green and numbered 60016. Those three locos plus an old one I had been given by a neighbour was the basis of the HD collection. It turns out that the old engine wasin fact a prewar 0-6-2T in Southern Green and is pretty rare. It has the prewar connectors and comes with a Southern brake van which is also pretty rare. Worth something if they were mint and boxed but they are in fact well used but very nice. Then I discovered the Michael Foster book of Hornby Dublo and the collecting started. This book is essential reading for anyone interested in HD and tells you everything you would ever want to know about HD, locos, rolling stock buildings and accessories. So if you want a picture of every HD loco made in the order they were introduced including the very rare ones look in the book. This selection contains my locos in approximately the order I bought them. The Duchess of Montrose is always easy to find and this was added to the collection followed by a Bristol Castle which was in very nice condition. Then came a Duchess of Atholl which was introduced before the Montrose, has no smoke deflectors and is in pre-nationalisation LMS Crimson Lake. Then came Sir Nigel Gresley, introduced pre-war with full valences and very valuable but re-introduced after the war with cut away vrunner shown with two Gresley teak carriages but now pulling four and looking very good with its red painted wheels just like the real one.alences but still in LNER Garter Blue. A lovely loco and an excellent runner. I also have a gloss version of the Duchess of Montrose. The Silver King also came on Gloss and Matt versions. One more steamer was added to the collection before I found the diesels and this was the 7F loco which was a 2-8-0 engine mainly used for goods trains but also happy to pull carriages if required and had a good turn of speed despite its small wheels. This is the half inch motor version, the later one with a Ringfield motor is rare and very expensive – a good reason not to have one. So the collecting started in 1998 before digital cameras, broadband and ebay and progress was slow via Swap Meets, a local model shop which sometimes had three rail and the Virtual Swap shop on the net which had people offering lists of HD for sale and by 2002 I was up for a change and looked at the diesel range. to the other which is the HD “version” of the mighty Deltic with its 2 Napier engines and rapid progress up the East Coast Mailine their only fault in some peoples eyes is that they replaced the A4’s. I say version as the HD model was considerably under scale length and the front end is out of proportion to the original. The 3 rail version of this engine, St Paddy is rare and very expensive, my one is a 2 rail body, Crepello, on a 3 rail chassis. Finally on the diesels at this stage was a Class 8 shunter re-painted with a yellow front and yellow connecting rods. then came the un-named, unnumbered Deltic which HD sold before the final Deltic livery was agreed by BR. This had a slightly different body to the final Deltic and remained on sale throughout. 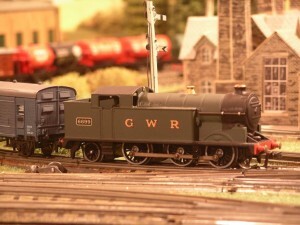 Then came a GWR version of the 0-6-2T which is pretty rare. 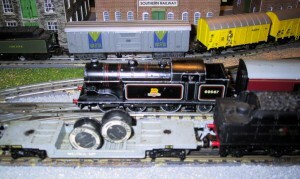 I also have a LMS version but I can’t find a photo at the moment – perhaps laters. So is that really my HD collection without the mods and re-paints. I need to check that I have not missed one or two. Whilst this search for engines was going on I was also collecting the rolling stock. An example of each of the tinplate rolling stock was easily obtained if it was BR but I did not get into the pre-nationalisation stock in any great detail. 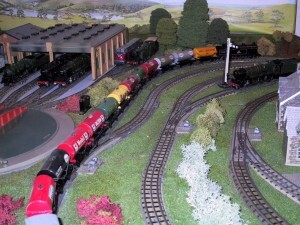 A train of LMS coal wagons, a lovely collection of tank wagons and one example of each of the super detailed wagons except the bogie tank and the tractor on the flat and the …….. well some were just too expensive. So at this stage collecting was overtaken by running interesting trains with conversions and even modern rolling stock. So we move onto the next section. Thankyou so much for your experiences. I always wanted a HD set, so I am slowly getting together enough 3 rail stuff to build a workable 8 x 4 layout in double track. My initial running of these old masterpieces has surprised me by how good the engineering was, and how robust. I am no shrinking violet with models either, as I have a fully working Marklin digital layout, and have dabbled in the past with scratchbuilding in Protofour. Now I am older, I really appreciate the ready-to-run quality of HD. The first comment on my new website! Many thanks. HD engines are wonderful runners so if you want the sound of rattling around the layout as the metal wheels and tinplate go round have go. Lay it loose and if you don’t like it take it up again. Hello, This is not a direct comment other than an attempt to thank you for this inspiring website. 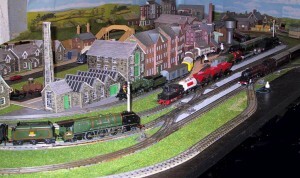 If you would respond to my email address creating a link I could send details of my ‘Northern Heights’ layout. If you think playing with 50 year old HD is difficult in the UK then try doing it in the USA. No kidding Brian, I am in Florida, but from Wales originally. Still have my first set from Christmas 1947. N2 Southern Goods 2594 in Olive Green. All still in its original box. I am in Florida, Sarasota. I sold my collection of Hornby Dublo in 2005 when I came here but had withdrawl symptoms and have since trawled ebay extensively and have a pretty good collection including many of Tony Coopers items. Sadly, I have no space for a layout, hence static display only. You might not have room for a permanent layout but how about getting a 32 in. x 80 in. Unfinished Flush Hardwood Interior Door Slab from Home Depot for $42.94 which will take a single oval of HD track with plenty of room in the middle for sidings and a station. You could either loose lay or screw down and leave it in the garage between running sessions. Put the door on some tresles or even boxes in the garden (yard) attach a controller and you are off and running. You know it makes sense rather than leaving them in a display case. Hey thanks for the site, i have my old HD from child hood and love to collect still now but must disagree about CO BO being ugly! She is cool as like a split screen vw (oops another HD model)! Look forward to your additions to the site. Trev, Be very careful, you could be close to picking up a nasty case of collecting flu. There are a couple of very scruffy ones plus this one as a Buy it Now put this number in the search, 320646479062 which looks OK but they come up pretty often and mostly below £100 for a post war one. If you have an engine you will need to run it, if you run it you will need coaches and track and a controller and befor eyou know it you are hooked to the rattle of three rail. If you really want to catch the bug there is a rail fair/swap meet in Manchester this weekend, Sunday 30th, Manchester, George H Carnall Leisure Centre, Kingsway Park, Davyhulme. M41 7FJ which should have some 3 rail but probably not a Gresley. Great site just what a frustrated HD layout planner needs. Tried for years now I know why I failed. Great Info keep it coming please. 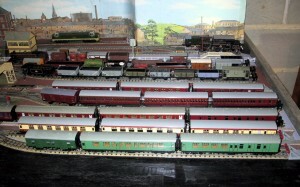 I have a box of 3 rail track,switches, cars, couches, a Mallard, signals, some building s etc. form about 1960, where would go to find someone interested in this equipment? I have pictures if necessary. 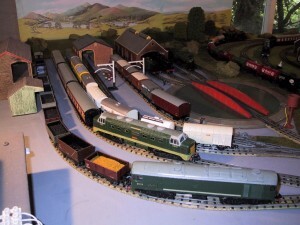 Also have a 2 rail hornby loco and coaches from a newer era. Seems a shame for this to sit in my garage.. 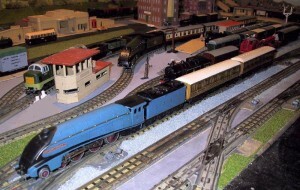 I have sent an email to Marwan Nusair who is a US collector of Hornby Dublo. There are not many of them in the US as I understand. Maybe he can help. He is in Cincinnati which might be as far from you as I am. Let me know if you need more help and I will try and find some more US collectors. It is so nice to see pre war dublo still around and running and in quite good condition. You have a very rare loco and set of wagons there. Do you have any more pre war dublo? A wonderful discovery! I thought I was the only one out with a passion for three rail. Tips on repairing H.D would be very useful. I bought an 2 6o tanker from E bay .It worked well until I ” serviced” it .Hasn’t moved since!! If in the course of the repair you removed the magnet and/or the armature you will have lost the magnetic strength of the magnet and this could be the cause of the problem. If it is this than the problem can be fixed by using a Neo magnet or having the original re-magnetised. I have now posted all (I hope?) of Ron Dodds service and maintenance videos as separate links on the Links page. These are truly invaluable if you want to keep your HD running. Ron if you read this can you let me know which ones I have missed. I enjoyed reading this very much- fascinating and mostly in line with my own experiences- ie I first had HD 3-rail as a boy in the 1950s- have it up in the 1970s and returned to collecting and substantially expanding my original remaining items in the 1990s! I do have to disagree with you one one topic the Co-Bo which you described as an ugly prototype and and ugly and unpopular model. The latter is true as more were left of this model after HD ceased to be than any other! On the other hand, it is a better scale model than the Co-Co Deltic which is far too short and I managed to get one in excellent boxed condition on eBay two years ago for an unsilly price and am very glad I did because a) prices have increased b) it completed my collection of HD steam and diesel- with the exception of the maroon City of Liverpool which is always going to be very expensive and the 0-6-0T which I have never liked for its plastic body shell. I have to say the Co-Bo runs extremely well and looks good with a string of S-Detail trucks. In fact it runs better both ways than the Bo-Bo which always seems to prefer to run cab first in my experience. Its now my favourite of all four HD diesel designs- the 0-6-0 shunter is the most attractive but they are poor runners- I have had two and now my second run has started to run hot after only 15 mins in action. On that topic I would say that the 2-6-4T (my first HD loco), the 0-6-2T, the 4-6-0 Duchess (post-war version), the 2-8-0 freight and the 4-6-2 Barnstaple/Dorchester are overall the best runners in the fleet. Have just been on the home page and read that Richard is converting a Barnstaple to 3 rail I have a Barnstaple 3 rail always thought it was bought brand new by my father the layout was packed away in the early sixties only till recently that I was looking at an old brochure on a website there the 3 rail loco was named Dorchester and the 2 rail Barnstaple does anybody know if Hornby made a 3 rail Barnstaple. Meccanno i.e. 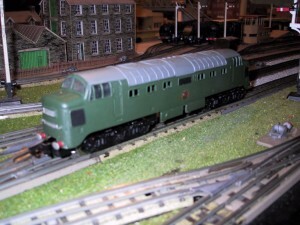 Hornby Dublo made the rebuilt Bulleid Pacific in two types – The main version was Barnstaple as a 2 rail engine as all of Hornby Dublo had gone to 2 rail by the time this loco was issued. To keep their old 3 rail customers happy they also issued the engine as Dorchester in 3 rail. Not many were made and this engine is now highly collectable. In other words worth a lot more than a Barnstaple which is why if you are a runner you would convert a Barnstaple to 3 rail and not spend a fortune on a Dorchester. Should have done this in the first place The axles are sleeved so it is obviously a 2 rail Barnstaple that has been converted an early one at that been packed away for fifty years so I thought that it was either factory or the bodies had been swapped Dorchesters must have been scarce then. 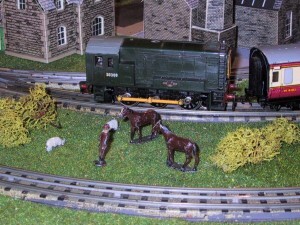 I have just obtained one of these locomotives. As I expected it needed a good clean to release the gearing in the BO end. New traction tyres as the old ones were welded to the wheels, and a magnet in the Ringfield motor that was hardly a magnet. So for the last item I ordered a new N52 plated SUPER NEO MAGNET. It duly arrived and I fitted it. The improvement was great as with all the other replacements of this type I had done in the past, but on passing a metal coach or truck or engine tender, it immediately attracted it to itself!!!!!!!!! An accident just waiting to happen, (on a single track line this would not be an issue of course). The magnet is very strong and the magnetic field reaches across my double tracks and is the root cause of the problem. Has anyone had similar issues with this type of magnet and knows how was it solved. I have experimented sticking two metal plates inside the body of the CO-BO but as the bogie is very ‘loose’ and flexible it sticks to one or the other of the plates. I have found that making the bogie stick to the inside radius plate the loco does not derail itself on a bend. But it now uses the metal body of the loco as an amplifier for the sound the motor makes. All suggestions or help gratefully received. 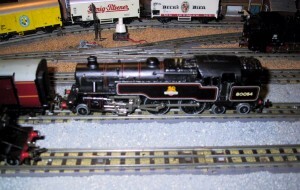 My first HD loco was the 2 rail Royal Scot set with the Crepello locomotive as a Christmas present way back in 1963. This is what started my passion for model railways. I still have her in running condition, mind you with quite a bit of wear that leads me to my question that has challenged me for a number of years. Why does she badly wobble whilst running? I have packed the bar that the body screws to at the motor and trailing bogies, only a small improvement. People have said the traction tyres are not correctly nested in the wheel grooves – not the problem. Does this point to the axle wear in the bogie castings? Also the wheels on the non-motorised bogie are heavily grooved. Is this problem caused by the combination of all of these symptoms of general wear and tear. But wait, I recently bought an E3002 loco that has hardly any use and she also shakes and wobbles. I do expect some shaking due to an imperfect track laying (most point and track is original dublo). Would appreciate any thoughts on anyone that has this experience otherwise I still enjoy running these vintage models. My Crepello is on a 3rail chassis, probably from one of the unnumbered unnamed versions before they issued Crepello. There is a slight wobble only over the non motorised bogie when going through trailing points at a medium speed which is less noticeable if you run faster. No wobble at any other time. The non powered bogie wheels have no grooves. Is it possible that the deep grooves that you mention on the non motorised bogie are in fact wheels which are meant to have tyres on them as I have never seen or heard of HD wheels wearing a groove due to running. Have they been changed or has the whole bogie been changed from a motorised one? Seems very unlikely! But who knows. Can any one else help? Thanks for your quick response. The wheels on the non motorised bogie are original, with the outer wheels not the floating centre wheels, are heavily worn what I have called ‘grooved’ from trackwork. The shaking and wobbling occurs generally anywhere but more noticeable at moderate speed along straight sections of track. The shaking appears to be worse on the motorised end. I generally run motorised end first. Thanks for your kind advice and assistance. As I am in Australia I will try to source the wheels locally but not confident, otherwise contact The Dublo Surgeon for spares where he may have good complete bogies minus the wheels so I could do a complete overhaul of the running gear.